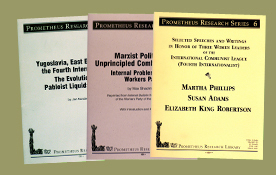 The Prometheus Research Library is a working research facility for a wide range of Marxist studies and also the central reference archives of the Spartacist League of the U.S., section of the International Communist League (Fourth Internationalist). Library holdings include substantial materials on the organizations inspired and led by Marx, Engels, Lenin, and Trotsky, as well as works on related topics, sometimes remote. The Library’s collection, which does not circulate, grew out of the accumulated and organized holdings of James Robertson, both correspondence and printed materials. The collection now includes over 7,000 books, pamphlets, and periodical volumes, 270 reels of microfilmed documents and periodicals, and over 200 linear feet of archival documents and bulletins. Particular emphasis is on minutes of leading committees and internal discussion material. Approximately three-quarters of the holdings are in English. 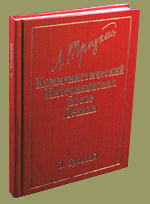 There are significant materials in Russian: over 300 titles covering much of the record of the Bolshevik Party in the form of stenographic records of Congresses and Conferences, public leaflets, internal party documents, early Cheka reports, memoirs, as well as publications and exile correspondence of the Left Opposition. Holdings in German, French, Spanish, Polish, Chinese, Greek, and other languages are also significant. Books and pamphlets are catalogued in a card file and research is facilitated by an extensively cross-referenced digital catalogue available on this website. The Library also contains the published works of many non-Marxist authors who strike our interest. Since 1979, the PRL has circulated lists of recent acquisitions to interested libraries and individuals. These circulars are available upon request. Major published documents of the First through Fourth Inter­na­tionals. Protocols of Executive Committee meetings and World Con­gresses of the Communist International. Principal peri­od­i­cals, pamphlets, and leading body minutes of the early American Communist Party. Central body minutes, internal bulletins, and internal cor­re­spond­ence of the American Trotskyist movement, plus its public press, pamphlets, and theoretical organs. Materials cover the initial Trotskyist expulsion in 1928, the founding of the Communist League of America and the later Workers Party, the period of entry into the Socialist Party, and the Socialist Workers Party. 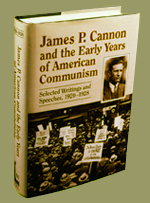 Substantial collection of works by James P. Cannon, founding American Communist and Trotskyist leader, including writings and speeches from the 1920s and early 1930s. Extensive internal materials from the Workers Party/ Independent Socialist League (led by Max Shachtman) and its youth affiliates from the 1940s and 1950s. Minutes, documents, and bulletins of the International Sec­re­tar­iat of the Fourth International (mostly in French and English). Books on general subjects ranging from the history and struggle of colonial masses to various idiosyncratic interests of Marxists and others. 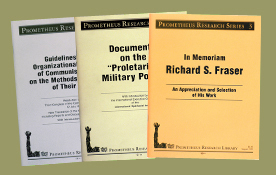 The Prometheus Research Library has evolved over 40 years and works under the auspices of the Central Committee of the Spartacist League/U.S. The PRL is a member of the American Library Association and has staff and individual associates in the United States and internationally. The PRL seeks to assist serious efforts to publish histories of Trotskyist sections around the world, both by providing documentation and where appropriate financial support, without regard for our particular agreement with the views of the authors. The Library strongly supports and participates in efforts to make available and exchange historical material with individuals and libraries of kindred purpose around the world. The PRL has collaborated with Bryan Palmer on his biography of James P. Cannon and history of the work of the American Trotskyists in the Minneapolis Teamsters strikes. The PRL also collaborated with Louis Sinclair, the noted bibliographer of Leon Trotsky’s work. George Breitman, editor of Trotsky’s Writings, advised the PRL in the early stages of the production of our first book, James P. Cannon and the Early Years of American Communism. The PRL deposits archives of the Spartacist League/ U.S., Spartacus Youth League, and ICL in the Hoover Institution on War, Revolution and Peace at Stanford University and the International Institute of Social History in Amsterdam. The Prometheus Research Library seeks to collect, preserve, and make available the documentary record of the international communist movement. The PRL’s publishing program makes available rare materials that are an indispensable part of the documentary history of the Trotskyist movement. We are very interested in obtaining originals, photocopies, or digital copies of relevant minutes, bulletins, or correspondence to ensure that such historically valuable documents are not lost. Persons who have such archival papers are encouraged to contact the PRL. The PRL shares relevant portions of its holdings with other archives and libraries to make the archives of the workers movement more complete and accessible. 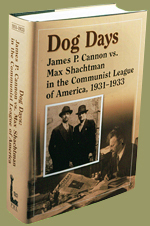 This volume of Cannon’s writings covers the period when he was one of the principal leaders of the American section of the Communist International. 624 pages; smyth-sewn binding. (1992) Both volumes include an extensive introduction, explanatory notes, photograph section, glossary, and index. The PRL also distributes the bound volumes and microfilm editions of ICL periodicals. At present, these include: Workers Vanguard, newspaper of the Spartacist League/U.S. ; the press of its youth organization, Young Spartacus; Women and Revolution; and the ICL theoretical journal Spartacist in English, German, French, and Spanish. Each volume or microfilm roll contains a complete cross-referenced index. For price information and to order, please write to: Spartacist Publishing Co., Box 1377 GPO, New York, NY 10116. For additional information visit the ICL at www.icl-fi.org. The Prometheus Research Library is open to researchers needing our specialized collections. Since the Library operates on a limited schedule, researchers are required to send written requests about specific projects and for appointments. The PRL has a digital microfilm and microfiche scanner and printer. The Library is located in lower Manhattan. Box 185, Canal Street Sta. Box 32463, Civic Center Sta. Spartacist Publishing Co., Box 1377 GPO, New York, NY 10116. For additional information visit the ICL at www.icl-fi.org.